I've been struggling to get over a cold since Thanksgiving, which has sucked but also has reminded me that it's finally chilly outside! Warning: controversial opinion coming... Winter is my absolute favorite season (minus cold viruses). I look forward to the frosty mornings, frigid nights, sparkling snow, and cozy wines more than anything else! While I might not be able to drink wine until I get over this cold, I wanted to share one of my favorite cozy wine regions with you: Languedoc-Roussillon. 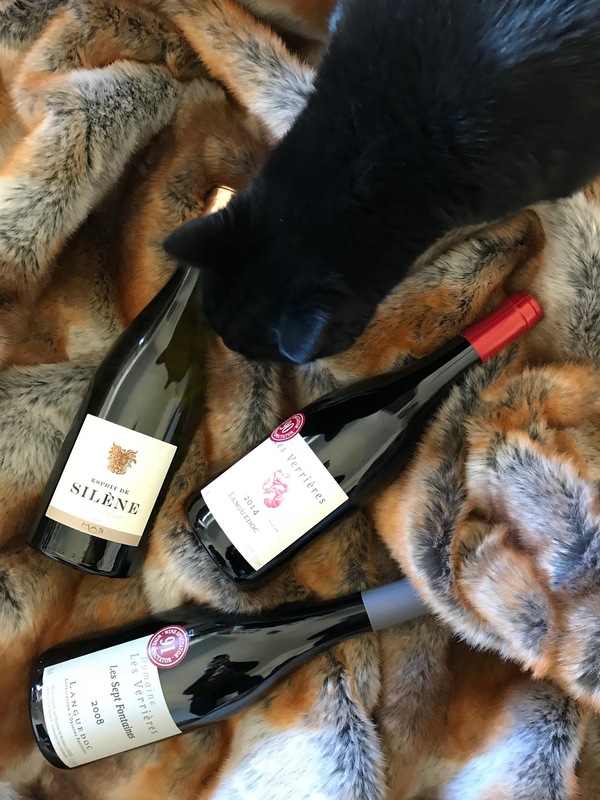 It's a warm climate region in Southern France with hearty, fruity wines perfect for nights full of blankets, candles, and kitty snuggles. Wondering why I put wine bottles on his favorite blanket. Languedoc-Roussillon is a large wine region that hugs the Mediterranean Sea and taps on neighboring Spain's shoulder. Beyond affordable wines, it is known for beautiful scenery and a sublime climate—perfect for growing grapes and keeping costs down. This region is home to a great number of appellations, many of which fall under the Vin de Pays category. Vin de Pays (n.): Country wine. Languedoc-Rousillon wines are Vin de Pays d'Oc and are often labeled as such. Most of the bottles you'll find will be labeled as Languedoc or Pays d'Oc but there are a few other designations to keep an eye out for: Minervois, Saint-Chinian, Picpoul de Pinet, Corbières, and Limoux. TIP: While you can find cheap Pays d'Oc bottles, grab ones that are closer to $15 to get the most bang for your buck. By paying a few dollars more, you're likely to get a bottle with more character than its price tag suggests. Maison Aguila Crémant de Limoux Brut NV (Sparkling): 65% Chardonnay, 25% Chenin Blanc, and 10% Mauzac. I opened a bottle to celebrate this blog's launch! It's $14.99 in PA.
Domaine Les Verrieres Les Sept Fontaines Languedoc 2008 (Red): 40% Syrah, 25% Carignan, 30% Grenache Noir, and 5% Cinsault. $11.99 in PA.
Domaine Les Verrieres Languedoc 2014 (Red): 60% Syrah, 20% Carignan, and 20% Grenache Noir. $11.99 in PA.
Domaine Paul Mas Esprit de Silene Languedoc Blanc 2016 (White): 45% Grenache Blanc, 35% Marsanne, and 20% Vermentino. $13.99 in PA. TIP: For wines with fuller bodies and riper flavors for winter, seek warm climate regions. Languedoc-Roussillon blends lean heavily on grapes like the ones above for their body and rustic charm. Expect flavorful, easy-going wines that will warm you up when the snow starts to fall! Ready to explore other inexpensive wine options? Check out these affordable alternatives to Champagne. Can you please tell me if it's possible to Acheter cialis generique en ligne sans ordonnance in France? is pharmacielasante.com reliable and safe online pharmacy?